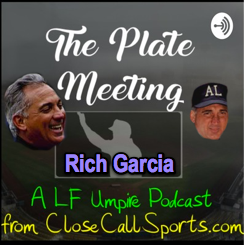 The 10th Plate Meeting podcast episode features 25-year American League veteran umpire Rich Garcia, who joins the show to discuss his officiating career, a major league umpire strike and labor dispute, and his brief foray into the movie business as an umpire in the Kevin Costner-driven film, For Love of the Game. Rich also had a stint as a broadcast analyst and was on-air for the Kent Hrbek/Ron Gant play in the 1991 World Series. We talk about some ejections—such as Tim Foli over a dispute regarding how the baseballs were rubbed before the game—and also ask Rich if he had any odd plays in right field during his postseason career, and if he ever heard of a guy named Vic Carapazza. Click the below play (▶) button to listen to "Episode 10 - Rich Garcia Umpired for Love of the Game" or visit the show online at https://anchor.fm/the-plate-meeting. The Plate Meeting is also available on iTunes (Apple Podcasts), Google, Spotify, Stitcher, TuneIn, and several other podcast apps. Alternate Link: Episode 10 - Rich Garcia Umpired for Love of the Game. Related Video #1: Hrbek and Gant meet at first base during the 1991 WS (54:00). 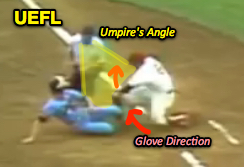 Related Video #2: Scene from For the Love of the Game with a cast of MLB umpires (57:00). Related Video #3: The infamous Jeffrey Maier play and Derek Jeter home run in 1996 (1:11:00). It's time for another Tmac Teachable brought to you by the good folks at ProUmpireCamp.com! 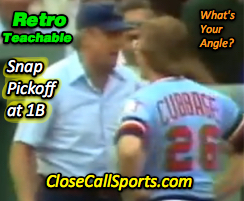 Today's retro moment features 1B Umpire Bill Kunkel's ejection of Twins runner Mike Cubbage and Manager Gene Mauch over a back-pickoff play that retired Cubbage at first base. What angle should umpires take to receive such a play and how should officials respond to a runner who acts as Cubbage did? 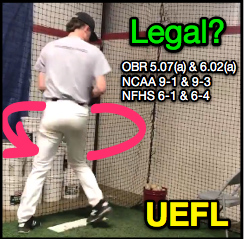 Before we dig in, Pro Umpire Camp is the only three-person camp that will have college assignors and supervisors from the Atlantic League, Can-Am League, and the American Association. Whether you're just trying to learn three-man or looking to be seen this camp is a great place to start! This offseason's Tmac's Teachable Moments are brought to you by Pro Umpire Camp. It's important to remember a couple items as we dig into this edition, and this ejection. First, we are looking at this play from a 2019 prism. We're not focused on the judgement of the call, but rather how in today's world we can get this play right. Today's officials are: HP Umpire Al Clark; 1B Umpire Bill Kunkel; 2B Umpire Bill Deegen; and 3B Umpire Terry Cooney. This is the second game of a doubleheader. 1B Umpire Kunkel officiates the pickoff play. On our upcoming podcast with American League veteran Rich Garcia, we talk about Kunkel and Cooney. In our situation today, we have runners on first and second and one out. The pitch is a swing and a miss and there is a back pick to first base. Our goal is to have the glove coming at us so we're going to want to be to the side Kunkel is on, but from an angle standpoint we want to be able to see the tag and the front of the bag that the runner is sliding into, so our best spot is probably a couple steps into foul territory toward the back edge of the bag. If we are engaged with the moves of our first baseman this will be easy. As fans of the Teachables know, I'm a proponent for getting your nose into a play like this, but we always suggest doing what makes your assignor happy. Most good assignors are happy when we get this play right in the three- and four-umpire system. Cubbage and Mauch outnumber the umpire. So now that we know where we should be (foul ground, not moving if possible), reading the first baseman's movement, what about the aftermath? Well, once Mike Cubbage, the player who was called out, is ejected for launching his helmet, the crew chief needs to get him out of there. It's a near certainty that the Manager (or head coach as the case may be) will be visiting shortly. If the crew chief is involved in the call the "two" on the crew (aka backup crew chief) needs to get into the action and help lead Cubbage to the dugout. This is especially the case if no other coaches or players are helping. Now it gets tricky. 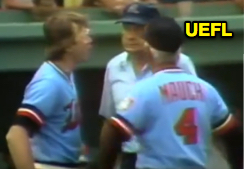 The manager of the Twins, Gene Mauch, immediately makes contact with Kunkel and is summarily ejected. The tantrum continued in the Twins dugout. Now, all umpires need to be engaged with the situation. Once contact is made it's all hands on deck. Kunkel, a former MLB pitcher, whose son also played in MLB, handles himself well here. I could do without the wave off, but under the circumstances I understand. Also, while the announcers were mostly fair, did you head one of them say it was a delayed call? Didn't look delayed to me! At least not nearly as delayed as the time we had to wait to resume play after Minnesota littered the field with bats. As we get ready to either watch baseball (if you're stuck in the cold), or head on the field, a few simple reminders: Read the rulebook—don't be the guy who doesn't know the rules! Second, be engaged! It's really hard, especially in rough weather to stay focused. Third, always think about the next possible play and be sure to be ready! Finally, have fun—you're umpiring a baseball game! What's better than that?! Until next time, Happy Umpiring Everyone!